Fund management firms in Asia are increasingly looking towards Europe, and it is easy to see why: in 2017, investment funds domiciled in Europe increased to €15.6 trillion ($17.95 trillion). Net assets of these funds increased by 10% during that year, representing growth of 95% since 2007. In terms of growth, Europe offers fresh opportunities and a wider client base. But breaking into a new market is not always easy. Managers must contend with a host of different complexities. Making the right decisions will result in opportunities for Asian fund managers, while incorrect strategies could lead to high costs and limited assets. Where is investor appetite for your product? Which distribution channels are accessible to non-domestic managers? Who are the gatekeepers, and what are their requirements? What are your client service expectations? What is the best approach to resource the sales effort? Understanding the nuances of the European market, and its distribution channels is a pre-requisite to building a feasible sales plan. The 12 largest investment consultants in the United Kingdom advise on over £16 trillion of institutional assets under management (AUM). In this market it is virtually impossible to do business with institutional investors without engaging an investment consultant, so managers must be able to support a robust due diligence process. The UK retail space also has independent financial advisers (IFAs) which own the lion’s share of the retail fund distribution network. The IFA channel is dominated by domestic funds, and requires managers to market its products and educate IFAs across the country. This necessitates an on-the-ground presence. In continental Europe, insurance and pensions assets are accessed more directly. Managers may choose to build relationships with European banks. 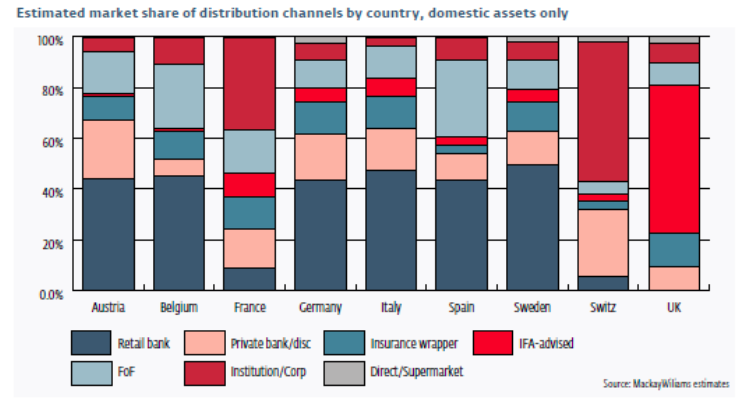 These banking institutions are the guardians of distribution, making up at least 80% of distribution in many countries. But MiFID II is changing the economics of the business model for third-party funds. To keep costs down, European banks are reducing the number of asset managers with which they work. This may offer both challenges for fund managers, but also opportunities. For example, some banks may develop white-label agreements, giving rise to sub-advisory opportunities. For a manager to find the right distribution partner, it must understand its own products and their suitability for each market. A local on-the-ground sales team can make all the difference. Large managers can make their local presence felt while smaller managers can begin either by targeting one or two markets, or by engaging an established third-party marketing firm. Europe is not a single, homogenous market. So, managers must build scale in every country in which they register. This is simply not viable when managers are testing the waters in Europe. A targeted approach that focuses on a particular market, segment or strategy could be more effective. Over time, a successful manager could then look to expand to new markets and fund structures. Managers entering the European market often overlook cost and cross-border distribution can quickly affect a funds’ total expense ratio (TER). Fund platforms are one such cost. Often, when managers enter the European market, they aim to get connected to every platform. Once on-boarded, they assume the task is complete. While platforms are important, they are only ‘shop windows’ that provide connectivity with distributors. They are not sales channel themselves. Another consideration is fund structure. Every vehicle targets a different client audience, and different strategies suit different fund structures. Cayman-registered funds remain a popular vehicle for the Asian market, primarily in the alternative sphere. But Cayman funds target a small pool of sophisticated investors. Managers targeting the European market may be better served by undertakings for the collective investment of transferable securities (UCITS) funds. Managers can launch UCITS funds both in their home markets (for example, Hong Kong’s SFC allows renminbi share classes to be launched directly under UCITS funds for retail investors), and across Europe. Europe offers plenty of opportunities for fund managers in Asia, but it is more important than ever for new entrants to be smart about entering the region. Building successful sales and branding approaches, accessing distribution channels, investing in local relationships and navigating an increasingly complicated regulatory landscape are all critical to success. Managers need to ensure all factors are taken into consideration and evaluated in detail. As part of this, managers should leverage the expertise of providers and partners – administrators, brokers, custodians, legal counsel, and others - to help understand the landscape and develop a cogent strategy. Further, managers should ensure that all providers who are party to a European fund have the right technical expertise and global model to help design a cross-border distribution strategy tailored to the needs of the manager. The administrator, in particular, should also be able to facilitate market access via fund registration services, local agent provision, introductions to local participants and efficient connectivity to distribution platforms. Developing a European presence is a challenge, but it is also tremendously rewarding for managers who get it right. To learn more, read our full paper or contact your local Northern Trust representative. This material is directed to professional clients only and is not intended for retail clients. For Asia-Pacific markets, it is directed to expert, institutional, professional and wholesale investors only and should not be relied upon by retail clients or investors. For legal and regulatory information about our offices and legal entities, visit northerntrust.com/disclosures. The following information is provided to comply with local disclosure requirements: The Northern Trust Company, London Branch; Northern Trust Global Services SE; Northern Trust Global Investments Limited; Northern Trust Securities LLP. Northern Trust Global Services SE, Abu Dhabi Branch, registration Number 000000519 licenced by ADGM under FSRA # 160018. The Northern Trust Company of Saudi Arabia - a Saudi closed joint stock company - Capital SAR 52 million. Licensed by the Capital Market Authority - License No. 12163-26 - C.R: 1010366439. Northern Trust Global Services SE Luxembourg Branch, 6 rue Lou Hemmer, L-1748 Senningerberg, Grand-Duché de Luxembourg, Succursale d’une société de droit étranger RCS B129936. Northern Trust Luxembourg Management Company S.A., 6 rue Lou Hemmer, L-1748 Senningerberg, Grand-Duché de Luxembourg, Société anonyme RCS B99167. Northern Trust (Guernsey) Limited (2651)/Northern Trust Fiduciary Services (Guernsey) Limited (29806)/Northern Trust International Fund Administration Services (Guernsey) Limited (15532) Registered Office: Trafalgar Court Les Banques, St Peter Port, Guernsey GY1 3DA. This information is not intended to be and should not be treated as legal advice, investment advice, or tax advice. Readers, including professionals, should under no circumstances rely upon this information as a substitute for their own research or for obtaining specific legal or tax advice from their own counsel. The information in this report has been obtained from sources believed to be reliable however Northern Trust accepts no liability in respect of the accuracy and completeness of this information. All information contained herein is subject to change at any time without notice. Any person relying upon information in this report shall be solely responsible for the consequences of such reliance.